Jesse Randhawa and Sandip Soparrkar became the latest celebrity couple to wed.
Randhawa was a high profile model and acted in Anurag Kashyap’s Gulaal, which was released earlier this year. She was also seen in Fashion and No Smoking. Soparrkar, a choreographer, shot to fame when he choreographed for the internationally messed up star Britney Spears’ Womaniser video. It was even rumoured that he was Spear’s new man. As it turns out, he is not. Jesse and Sandip. Now, that’s for real. So, Ranbir Kapoor and Deepika Padukone bid one another adieu. But the love still flows albeit towards a different man. And this time its not a cricketer but an unlikely one. If the rags are to be believed it is none other than Farhan Akhtar, Deepika’s co-star from Karthik Calling Karthik. The director of Dil Chahta Hai turned to acting with Rock On and Luck By Chance. Last heard, Akhtar was happily married to Adhuna. Time will tell if this titbit is just to get you curious about their new movie or whether it is just hogwash. November saw two high profile weddings when two Bollywood beauties decided to tie the knot with men in business. Shilpa Shetty looked ravishing and some say almost Aishwarya Rai–like in her bridal finery. Her designer of choice: Tarun Tahiliani. And the groom? London based businessman, Raj Kundra. 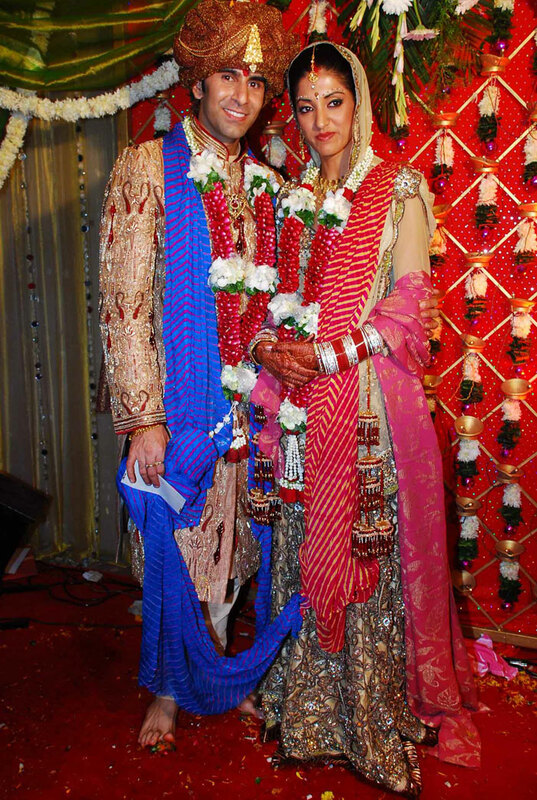 Isha Koppikar, the Khallas girl, married Timmy Narang, a restaurateur. That’s two down and several more to go! Aamir Khan and Kareena Kapoor. Is that a couple movie audiences should watch out for? Definitely yes! It seems from the video that they had a whale of a time together, and it’s not a secret how fond they are of each other. Aamir has apparently said that Kareena is so pretty, one can never get tired of admiring her all day long! Kareena of course accepts all the praise graciously, for she has a lot of respect for Mr Khan. 3 Idiots is scheduled to release on 25th December. Perfect timing, considering that it will be vacation time. Plus the film promises to be a lotta fun, and perhaps will have some situational comedy instead of the usual slapstick. Aamir has the tendency to get people’s hopes up with his films! Madhur Bhandarkar has a knack for getting together people you wouldn’t have imagined. Look at Priyanka Chopra and Arjan Bajwa in Fashion, or Bipasha Basu and Kay Kay Menon in Corporate. He’s done it again in Jail with Neil Nitin Mukesh and Mugdha Godse. They both look good. No second thoughts there. Neil is as handsome as handsome can be. And Mugdha is a Goddess in her own right. They make for excellent eye candy and would look awesome together in a photo shoot. But somehow, at least in the trailers, they don’t look too comfortable with each other. Waiting for the movie to release on 6th November 2009, and hoping that my observation is wrong! Seen Jacqueline Fernandez and Ritesh Deshmukh in Aladin? The movie, also starring Amitabh Bachchan and Sanjay Dutt, releases tomorrow. Jackie is a former Miss Sri Lanka. Half Malaysian and half Sri Lankan, she has modeled for quite a few brands, and this is her first film. Ritesh looks boyish and quite smart. So basically they make a good pair visually. Once the movie comes out we’ll know if she can act, and if the two can create more magic in a film that is already all about magic. The film London Dreams stars Salman Khan, Ajay Devgn and Asin, although looking at the Salman Khan – Asin combination one would want to term it nightmare. Asin is pretty in her own right, and there is no doubt that Salman is every bit the rock star that he is called. But to bring these two people together seems like a big mistake. Vipul Amrutlal Shah, the Director, who has also Directed Namastey London and Produced Singh is Kinng must have has his own reasons. We’ll have to watch the film on 30th October 2009 to know if he got his reasons right. Finally an on-screen couple that makes sense. I for one was tired of seeing Katrina Kaif with older men like Akshay Kumar, Govinda and Salman Khan. About time she was paired with someone her age, don’t you think? At least Ranbir Kapoor had a better mix, as he was paired with older and younger women almost equally. Amongst the older lot there has been Bipasha Basu and Konkona Sen Sharma, while the younger clan has Deepika Padukone and Sonam Kapoor. Katrina has always been made to look a little older than she is, so she doesn’t look way younger than her partner on screen. But since Ranbir and Katrina are round about the same age, in Ajab Prem Ki Ghazab Kahani she is looking her age, as is Ranbir. What a relief! If you’ve seen the trailers you’ll agree with me when I say they look so awesomely adorable together. I can see hints of chemistry there, whether it will work when we watch the film is what I’m waiting to know. That Himesh Reshammiya is not exactly a great actor is no secret. And that he doesn’t look too great with any of his co-stars is as universal truth as well. So when the trailers of Radio showcase a haggard Himesh with the effervescent Shenaz Treasurywala it comes as no surprise that they look pathetic as a couple. With a cute face and infectious smile to boot , Shenaz is almost a decade younger than Himesh, and it shows. She has been known for her bubbly image since her MTV days, and it has stayed on. One look at Hmesh and you know how wrong this couple is. It’s not that opposites don’t look good together; it’s something to do with Himesh. Is there any female actor in Bollywood that can look “good” with him? History teaches us to learn from our mistakes. But apparently this axiom doesn’t seem to apply to Bollywood. Why else would the disastrous combination of Govinda and Sushmita Sen be repeated? David Dhawan’s Do Knot Disturb stars Govinda, Sushmita, Lara Dutta and Ritesh Deshmukh. Sush plays Govinda’s wife in the film. If you’ll remember, they were cast together in 2001 in another David Dhawan movie, Kyo Kii… Main Jhuth Nahin Bolta. The film bombed as did the pairing. Did Mr Dhawan think that wouldn’t happen again? Maybe it will, maybe it won’t!